A very leading photo, Marshy and TB on the move heading towards Athens. Where could they be off too?? With Marshy’s track record the answer really is; Anywhere! How about that? I think that narrows it down some what. 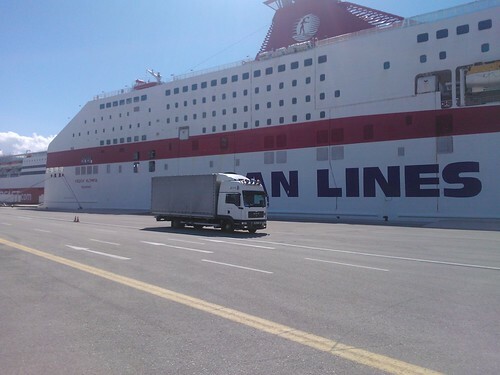 Mr Marsh sat in Lavrio Port, Greece waiting for the Salamis Lines ferry to? ?….you guessed it Cyprus. 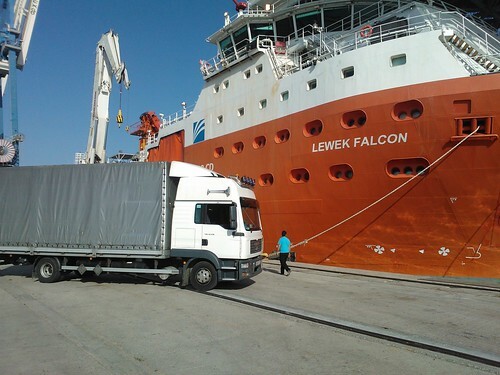 The job loaded in North Shields, GB and delivered to the vessel “Lewek Falcon” in Larnaca Port. The cargo was a 5 ton winch. The MAN for the job was Steve Marsh! Our top blogger and owner driver of Steve Marsh Express. Just while i’m hovering over the S.M.E. sales desk, there is really only one man worth trusting with such a job, when it’s crucial to get to a far away destination on time to meet a vessel that’s in Port for a few hours, call THE MARSH! Now although we all love a photo Marshy didn’t start snapping until the sun started to shine, so first up on the way was the Port of Ancona in Italy. This place must be awesome. 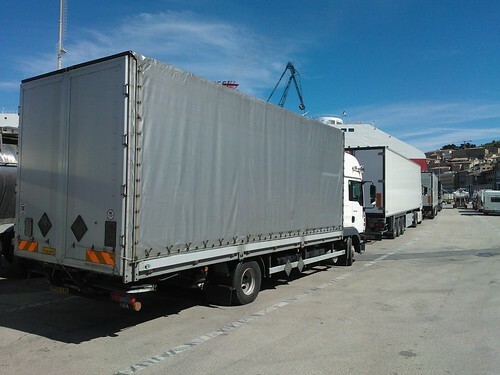 From what I can tell it is always rammo wall to wall with trucks, ships and any thing that will fit on a boat to the Islands of the Mediterranean. Luckily for our little MAN there was just room for him on the end of the row, while waiting for the Minoan Lines boat to Patras (I finally got a Minoan Lines sticker!). There was also a chance for the classic shot of truck next to ferry. 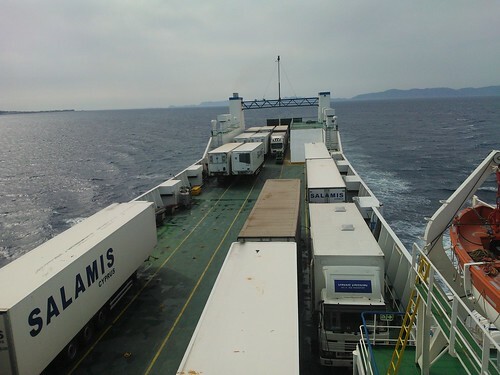 After arriving in Greece it was across to Lavrio in Greece for the Salamis Lines ferry to Cyprus. 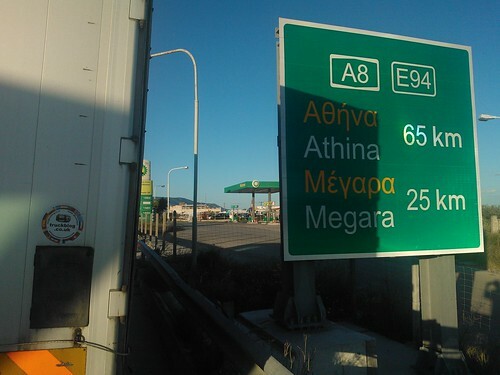 Having reached Lavrio, it was time for a weekend break before getting the Cyprus tub. Marshy wasn’t the only one weekended in Lavrio. 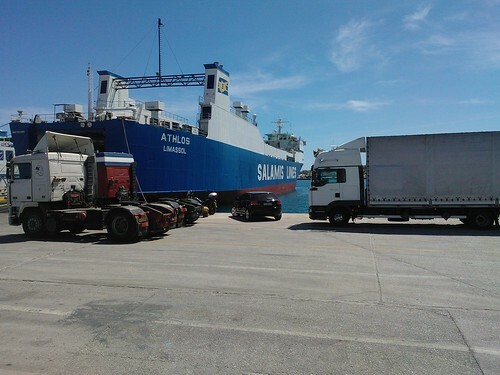 Also in Lavrio port were 2 Jordanian’s who were putting 4 trucks on the boat to Israel to sell back in Jordan. 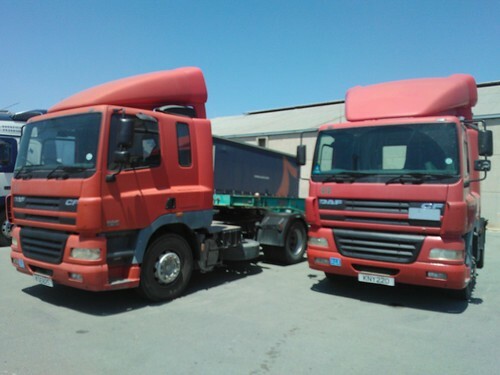 Then they were flying back to Germany to pick up 2 more trucks. 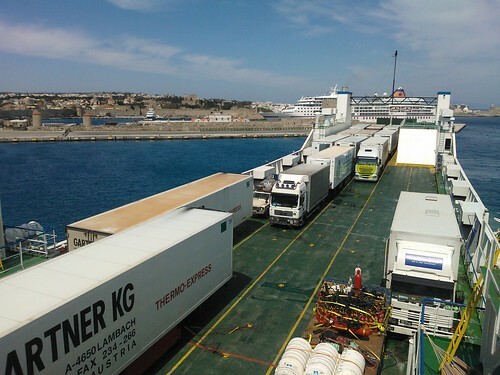 For those of you who aren’t too familiar with ferries to Cyprus, most tend to be multi-drop. By this I mean they tend to do a bit of a round trip rather than straight back and fourth. This ship was also bound for Haifa, Israel as well as Limassol. I know its out of focus, but Marshy spoke to this Dutch DAF driver, who was empty on his way to Israel, with what looks like a container trailer. Dear Mr Marsh, I’m sorry to say I can’t remember which boat scene was the outgoing and which was the return. The on board boat shots are always good, as you can see who else is busy doing similar trips. I remember one leg out or back was quite busy from what Marshy said. Have a good look at both pics as I have no idea which is which, but the Greek Scania horse box is in both! On arrival in Limassol, you are always greeted with some ex-pat trucks and of course every driver who goes has to get a pic of the Salamis Lines Scania 111 shunter. 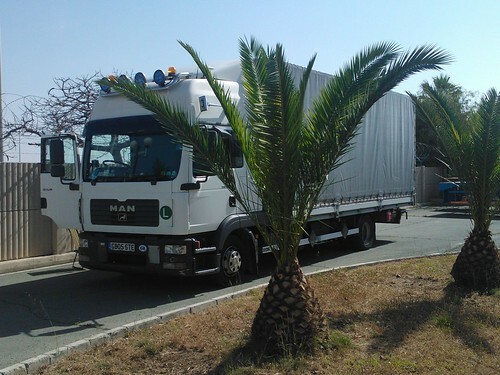 See if you can guess which well known UK haulier’s Volvo has a new life in the sun, leave your comments below. …Too easy for all you spotters! 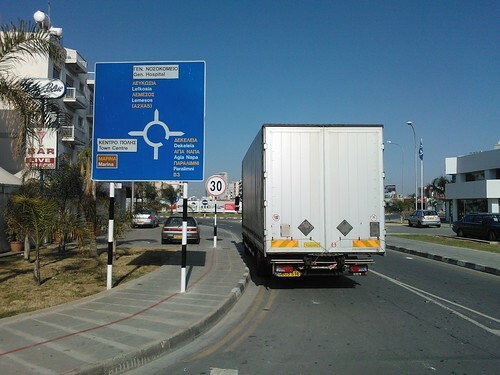 As you can see on arrival it was straight off the boat in Limassol and on the road to Larnaca. 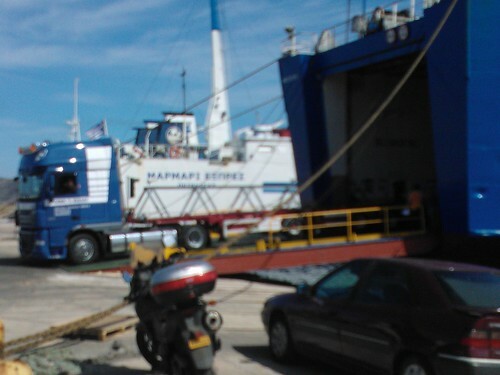 About 70 km down the road is the Port of Larnaca where the ships winch was safely delivered to the Vessel. 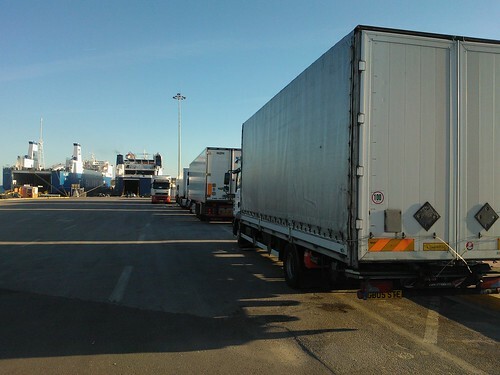 All that’s left after tipping is a wander back to Limassol, a wait for the boat back to Greece and then a long empty run back to Neuwied near Koblenz in Germany for a prearranged load back to the UK. Marshy has now been to more Mediterranean Islands than any gang of pesky Mosquito’s that we are all plagued with on our holidays. Saying that a week after his return from Cyprus the little MAN was right up North in Finland and then last trip, last week he was back at yet another Mediterranean island, but a lot, lot smaller, still a top class story to be told….another blog for another day. Now it’s time for the little MAN to have a rest under a palm tree and wait for his ferry back to Greece. Nice one Steve! 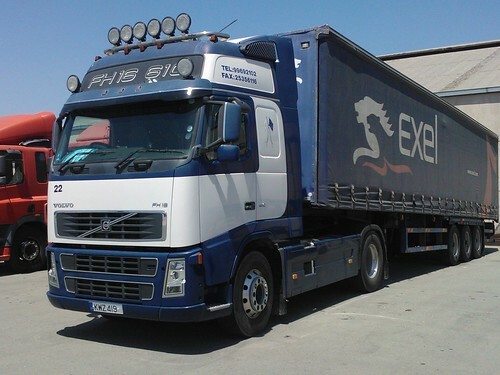 This entry was posted in Drivers Photos, International Mega Trucking, MAN, Steve Marsh Express, Truckblog on The Move by truckbloguk. Bookmark the permalink.